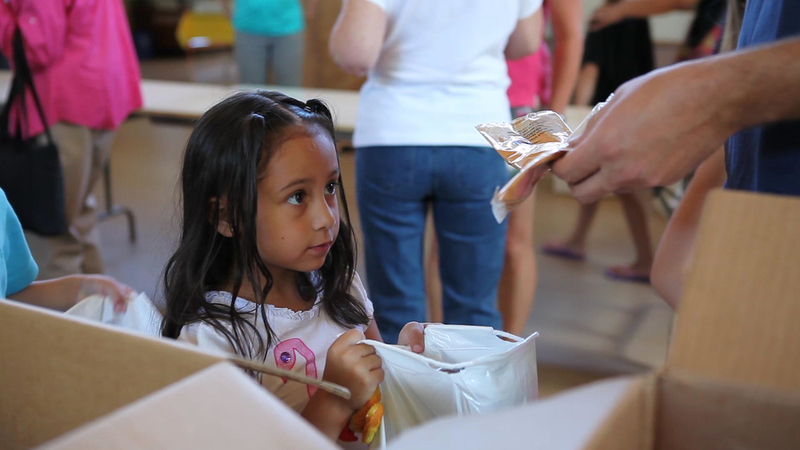 Food Kits from Lake Burien Pres. In the United States, one in five children live in poverty. Hunger is a thief that robs them of their energy, their hope and even their dreams of any type of a future. The numbers are staggering. In one of the greatest countries in the world this is the scenario. You might be skeptical. In the local Highline school district there are 18,000 children enrolled in public schools, of that number 12,000 students are on free or reduced lunches. This means that every one of the nearly 60 ethnic groups in our school district lives at this level of subsistence living. The statistic means that 70 percent of the students in the local school district live this way—wondering where their next meal will come from. 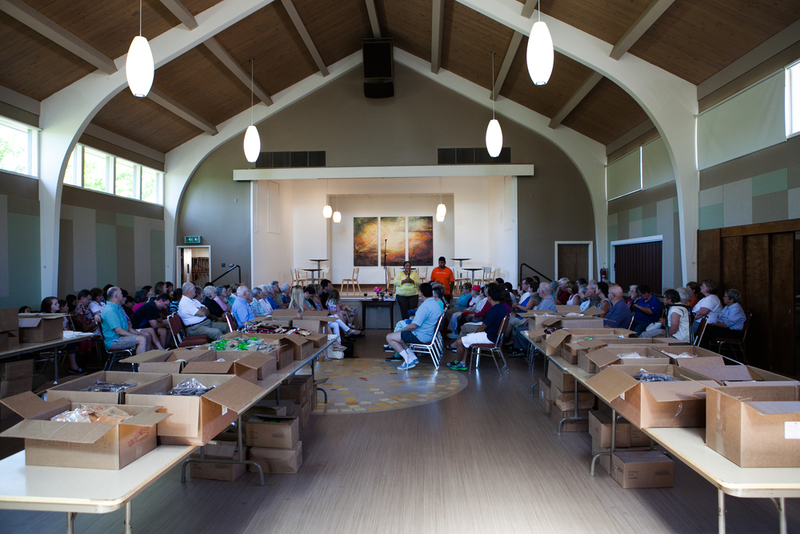 On Sunday June 30th the great people at Lake Burien Presbyterian Church suspended a typical worship service to actually be the church and offer a lending hand. This expression of service was their worship. 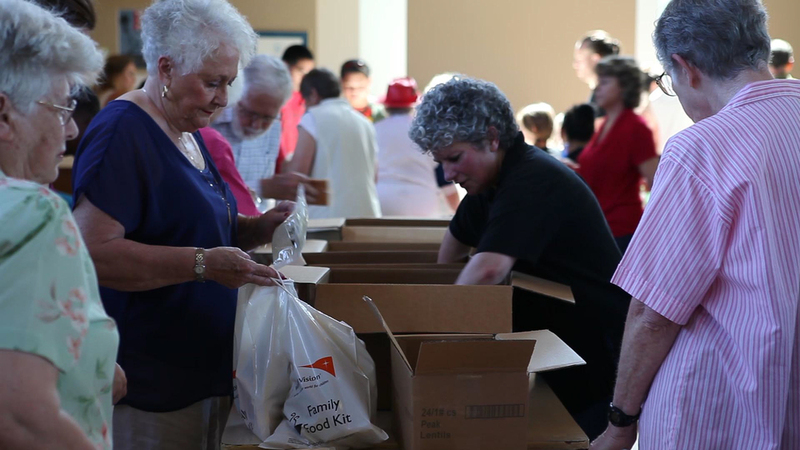 In partnership with World Vision the men, women and children built 600 food kits for the neighborhood families in need. These meals will be distributed over the summer to the families in a summer program with and for children. This is a partnership between Lake Burien and Seattle’s Union Gospel Mission. The most important aspect of the Food Kit is a handwritten note of encouragement that members of LBPC wrote to the family who will receive the Food Kit. These words of encouragement and hope bring a sense of community during times of job loss, disaster, family crisis and homelessness. It was an intergenerational and multicultural event where participants ranged between the ages of 6 months to 95 years old. There is something for everyone when the church stands up to be the Church.